Are you ahead or behind in mobile? How does your business compare to other brands, and to your industry? 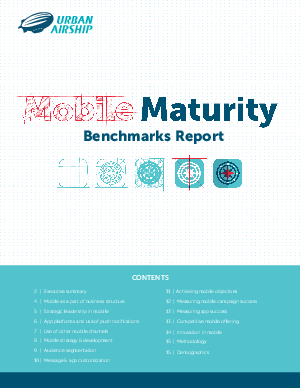 The Mobile Maturity Benchmarks Report answers these questions—and dozens more—with a comprehensive survey of 500 mobile executives, marketers and developers across eight industries. Get insights such as which tactics are considered the most essential and which are the most used, how brands measure mobile ROI, and how factors such as company size, leadership and organizational structure factor into mobile success.